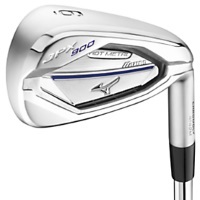 With the JPX 900 Hot Metal Iron, Mizuno set out to Engineer the Longest, Hottest - broad appeal iron they've ever made. By utilizing new materials and new methods of construction, they were able to produce an iron with an unmatched level of ball speed. POWER FRAME geometry is a result of Mizuno's Harmonic Impact Technology. The rigid POWER FRAME provided an extremely solid impact sound while allowing maximum face rebound. Through complex development techniques they were able to achieve Unitized Cup Face Geometry, delivering a massive COR AREA.